SLUH fosters the total development of students while engaging their interest. Our co-curricular program, which offers more than 75 clubs and student activities, provides abundant opportunity for social, spiritual, physical, emotional and intellectual growth. Click below for a sampling of some of our co-curriculars. A Cappella Club is for any student who loves to sing! The group performs quarterly on the choir concerts. All students who love a cappella music are welcome, whether they are currently enrolled in a choir class or not. Meets: In the Choir Room typically on Wednesdays during activity period. The Chinese Club promotes the study of Mandrin Chinese and Chinese culture. Club membership is open to all students. Activities are based on the decision of the elected officers. All activities are free to members. Guests may be invited to share some of the activities for a nominal fee. SLUH’s Robotics Club has partnered with selected Catholic middle schools in the city and surrounding underserved areas to offer robotics training in the STEM subject areas. In addition to providing Lego® Mindstorm® EV3 robot kits and software, the school’s outreach robotics program incorporates an initial workshop for using the kits and the programming software, followed by four to six sessions to assist staff and students in successfully developing the robotics curriculum and after-school activity at each middle school. Meets after school at various area middle schools. The French Club is open to students of French and all SLUH Francophiles. Activities throughout the year include the Mass in French for the Feast of St. Louis IX, King of France (Aug. 25); the International Festival in Tower Grove Park; crêpe-making after school; and the Francophone Film Fest in 218C (times and films TBA). We also invite you to visits with French-speaking musicians, cinéastes, cooks, and other practitioners of French culture from some of the 40 nations/regions of the world where French is spoken. Umbrella organization for all of the activities, competitions, presentations, trips, and experiences centered around entrepreneurship, business, and technology. The Math Club consists of students interested in improving their problem solving skills and participating in regional and national math competitions. Meetings are held at least twice a month during activity period. Some of the competitions include The American Scholastic Mathematics Association Senior Division, the American Mathematics Competition, the Missouri Math League, Excellence in Mathematics Competition, the Continental Math League Competitions, and regional qualifying competitions leading to the state competition held yearly in Columbia. Students interested in being a part of the Math Club should watch the bulletin board outside of the math office for meeting dates and/or see a moderator to receive messages via email. We also sponsor the SLUH Chapter of Mu Alpha Theta. This is a national high school and two-year college mathematics honor society that was formed in 1957. The purpose of this organization is to stimulate interest in mathematics by providing public recognition of superior mathematical scholarship and by promoting various mathematical activities that foster the enjoyment of mathematics. It is co-sponsored by the Mathematical Association of America, the National Council of Teachers of Mathematics, the Society for Industrial and Applied Mathematics and the American Mathematical Association of Two-Year Colleges. Juniors and seniors who have completed at least two years of college preparatory mathematics with a grade of a B or better in those courses and who have actively participated in math club meetings and events (to accumulate required points) may become members. Meets usually on Tuesdays during activity period or after school. 1. To make students aware of the different medical related fields that are available. 2. To make connections both with medical professionals and with other students who have similar interests and goals. 3. To gain educational opportunities related to medical fields. 4. An additional goal of the club is to help students gain a competitive advantage applying to undergraduate medical and health related programs. Meets during activity periods in Mr. O'Keefe's Room (s202). Students organize and try both the prosecution and defense arguments for cases that are chosen and distributed by the Bar Association of Metropolitan St. Louis each year. Teams compete against other local high schools and may advance to both regional, state, and national competitions. SLUH students get a chance to learn the federal rules of evidence and the art of working as a trial attorney or they get to protect the information for their side of the case and creatively take on the character of a witness. BBQ and great food prevail with all Mock Trial activities! Meets on Thursday during activity period in M122, and after school/weekends TBD by each team. NHS serves to recognize students who have demonstrated excellence in the areas of scholarship, leadership, service, and character. NHS members of the Anna F. Backer Chapter serve their community through Service of Presence, Service of Involvement, and Service to SLUH. NHS hosts annual teacher karaoke as well as teacher bagel day. Members also give open house tours and meet quarterly in the theatre. The SLUH Robotics Team builds a fully functional task-oriented robot each year to compete in the world's largest robotics league, FIRST Robotics. The team has six weeks to design, prototype, and build a robot that can complete each year's new challenge. The robot competes first in the St. Louis Regional Event and depending on the results competes in the FIRST FRC World Championship. SLUH's Robotics Team combines a multitude of skills including mechanical, electrical, design, computer and construction. Whether you are interested in engineering and technology or you just want to explore something new, the team would be glad to have you! Meets everyday after school during the build season (January - mid February) in the robotics room (M6); meetings outside the build season vary. Russian club is for all students studying Russian at SLUH. The club sponsors events that highlight aspects of Russian culture and the Russian language. Meets in M224 after school. The Science Club expose students to many different aspects of the field of science. We have monthly speakers, college students to professionals, discussing topics from detection of dark matter to bioengineering. We also compete in local and national science competitions like Science Olympiad, BEAMS, and Team America Rocketry Competition. The club meets every week on Thursdays during Activity Period in room S201. Each week we discuss science articles and work on student-led experiments. Students memorize and perform a Shakespearean monologue and compete at SLUH in December. The winner represents SLUH in the local competition. Meetings are held in the weeks leading up to the competition. Most of our work occurs during two three-week periods, one in January and one in April. During those two periods, editing the magazine (especially the literary submissions) absorbs lots of time. >>>CLICK HERE to visit site. Participates in Christian Interscholastic Speech League Competitions throughout the year. The competition dates for the year are as follows: October 7th, November 18th, January 27th, and February 24th (this finals meet is being hosted by SLUH). STARS-Student Teacher Association for Racial Studies- is a book reading and discussion club. Members include both faculty and students. Books chosen deal with racial issues. A club dedicated to animated television series, movies, and video games from Japan. If you have a small interest in anime and want to delve more into it, or just want a place to relax and game, this is your kind of club. The Blues Club brings together SLUH students who enjoy watching St. Louis Blues hockey. We have rather laid-back meetings where members watch highlights, discuss recent play/players, and defend their opinions. We'll be making shirts and sweatshirts this year so students can rep the club in and out of SLUH. LGB. The SLUH bowling club is a club for amateur and professional bowlers alike. We will start off bowling at least once a month on a Friday, Saturday, Sunday which will be determined at a meeting held before each time bowl. We hope to begin tournament or league play further on in the year. We also have a sweet design for a t-shirt or sweatshirt which may be coming further on in the year. Meets weekly during activity period. The Chess Club gives students the opportunity to improve their chess game through formal and informal competition. SLUH also competes in the Gateway Chess League. The top five players in the club play against other schools in matches on Wednesdays. SLUH students also can play chess in Saturday tournaments sponsored by the league. Information about the Gateway Chess League, along with weekly match reports once the season begins, can be found here. Or click on the match results below. The club meets after school everyday in the Ignatian Conference Room starting in the first full week of November until the end of February. After February, the club meets on Tuesdays and Thursdays only. The Circus Club meets in the Theater Loge, Thursdays during activity period. The climbing club climbs at a local climbing gym after school most Fridays during the school year. The organization has a horizontal leadership structure and meets on Friday at 3:10pm in M207. When: Upper Field during Activity Period and after school. The SLUH Fishing Club has active members from all classes freshmen–senior with a wide variety of skills and interests. The club meets at SLUH and has outings for the members to enjoy the fishing experience. The outings are an opportunity for club members to fish together, share knowledge, and enjoy the friendship of their classmates. The Lion Dance club is dedicated to the learning and study of the Chinese Lion Dance. Students dress in traditional Lion Dance apparel and often compete at Lion Dance competitions in the St. Louis area. SLUH Photographers document, and celebrate, life at St. Louis University High School. Our photos are used in the yearbook "The Dauphin", the student newspaper "Prep News", this web site, and in the publications of Admissions, the President's Office, and the Alumni Office. They are used for publicity and celebrations of school clubs and organizations, for slide shows of major school events, for the Cashbah catalogue, and other SLUH events. All students and faculty have access to, and can download, the photos that we file on the student server. The photography club owns several Canon digital cameras and lenses, and other photographic equipment. We have the ability to take quality photos of theatrical productions, as well as sporting and other events. All students are welcome to join the Photography Club, regardless of photography experience. Training is provided. The Ping Pong club allows students to play ping pong in a more competitive setting against fellow SLUH students who share an interest in the sport. The Outdoor Adventure Club, formed in 1995, is a student driven club whose goal is to provide challenging outdoor adventure opportunities while immersed in some of the most scenic areas of our continent and beyond. One of the largest clubs on campus, it serves anyone who wants to participate. All levels and ages of SLUH students are welcome. Students can pick and choose to participate various activities based on their interests. Activities are held year round, with trips generally offered during all four seasons of the year. The Club combines local outings with more ambitious out of state and sometimes out of country excursions. Periodically club fundraisers are held to raise money to defer trip costs. 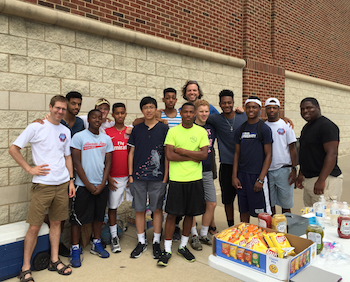 The Club has assisted in several community service activities, both locally and abroad. Clubs activities include but are not limited to: mountain biking (cross country, downhill and touring), hiking, canoeing, backpacking, mountaineering, whitewater rafting, snorkeling, scuba diving and skiing. Local outings often take place in some of Missouri’s finest State & County Parks. Numerous out of state excursions have taken club members: Mountain Biking in Colorado & Utah Backpacking in Glacier National Park and the Canadian Rockies Whitewater Rafting in Colorado, Utah, West Virginia, Georgia & Tennessee Downhill Skiing in Colorado Snorkeling & Scuba Diving in Mexico and Belize Hiking, Biking and Paragliding in Central Europe. Meets during activity period when appropriate and on the weekends for outings. 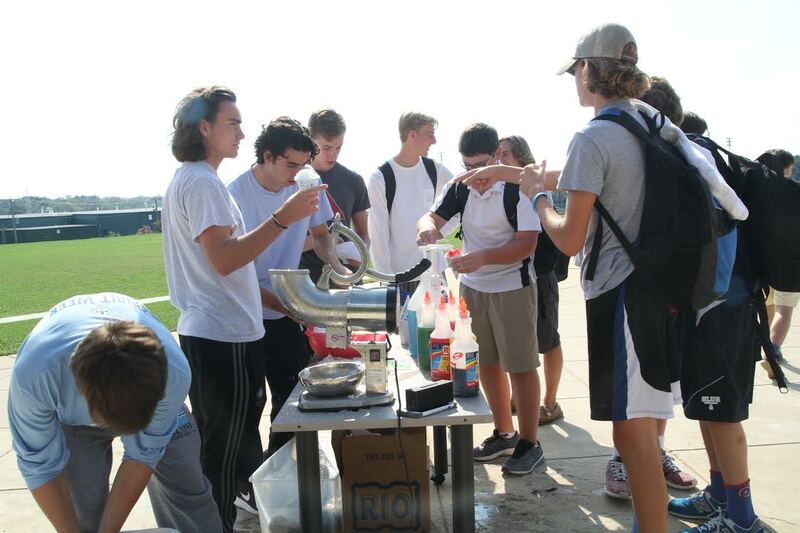 The SLUH Snow Cone Club is a student driven initiative to provide joy to the SLUH community by selling snow cones at events throughout the year. All proceeds of the SLUH Snow Cone Club will be donated to Fe y Alegria, an international organization aimed at providing education to the impoverished and excluded populations of the world. Specifically, our donations will benefit the education in Haiti. "EXPLORE NEW PLACES~EAT GOOD FOOD." The Staycation Club visits the diverse, fascinating neighborhoods of our Metro area—often well off the beaten path—and explores in-depth, always discovering wonders in the architecture, natural features, history, demographics, and people who live there. Wherever we go, we put away our devices and enjoy a meal together in a one-of-a-kind eatery for which the area is known. Check our bulletin board in the 2nd floor center hallway for news of upcoming trips. Whether you can make the meetings or not, you are welcome to join the excursions. This club runs year-round and is open to everyone at SLUH, including students, staff and teachers. Strategy Board Game Club is perfect for anyone interested in playing board games of merit or designing their own board games. SBGC meets on Fridays and has a semester-long Tournament to determine who the board game master is. The tailgate club sponsors many athletic events and holds tailgates before big games. It often partners with STUCO to give students an awesome gameday experience. We meet to share conversation and tea during activity period on Fridays in J124. This is a club for all students, regardless of knowledge and ability in weightlifting. Students can learn proper weightlifting routines, techniques, and diet to hopefully develop life-long habits of regular exercise and staying healthy. Meets: every Tuesday and Thursday afternoon from end of last period to about 4:30 pm. The Association for Cultural Enrichment at SLUH (ACES) promotes awareness and discussion of diversity issues at SLUH, while making all students feel welcome at SLUH. Through weekly meetings, ACES offers students a chance to come together as an affinity group devoted to understanding and dismantling racism. Through its yearly Philia Retreat, ACES provides a prayerful setting for students to consider their experiences and issues of diversity from a spiritual perspective. Through film screenings, fundraising car washes, prayer services, and discussion forums, ACES gives students a chance to organize important community events, raise their voices, and have fun. Every year, approximately 50-60 students are selected as Admissions Ambassadors. These young men present to prospective students, give campus tours, and work at various admissions events including the annual Open House and SLUH Night. Sophomores, Juniors and Seniors can apply for this position, must be recommended by the faculty, and are selected by the Office of Admissions based on their academic achievements, co-curricular involvement, as well as their leadership and communication skills. The cannonball club serves those students who are interested in discerning a vocation to priesthood and religious life. The club offers spiritual formation based upon the Spiritual Exercises of St. Ignatius of Loyola, with particular attention to the methods of personal prayer and the rules for discernment. Meetings consist of prayer, personal reflection, talks on the different aspects of priestly and religious life, and social interaction. The club is referred to as the "Cannonball" Club in honor of St. Ignatius, founder of the Society of Jesus. In 1521, Ignatius of Loyola was badly injured by a cannonball as a young knight in battle in Pamplona while defending the honor of the Spanish king. During his convalescence he read about Jesus Christ and some Legends of the Saints. He became enlightened, realizing that he was looking for something more in his life, beyond the riches, honors and fame he was pursuing in the king's service. He was being called to a life in the service of God and others. Thus, he left his family's castle after his recovery to study, teach and minister to those in need. Ignatius eventually established an order of like-minded men, which he called the Society of Jesus. Meets: twice a month on Friday's during Activity Period in J110. The Community Service Program is a voluntary program offering students in all four grade levels an opportunity to place themselves at the service of others. Students volunteer at selected sites throughout the school year as their schedules allow. Many programs offer a faculty chaperone for those students who are unable to drive. The programs are organized by populations served and type of service. Categories include: pre-school programs, tutor/mentor programs (elementary/middle school-aged populations), feeding/sheltering programs, senior programs, and sports programs for those with special needs. Throughout the school year some programs are added and some end, most often by program design. Liturgical Choir is a club open to students of all four years. You may elect to be a singer or instrumentalist for your particular class Masses, all-school Masses, special weekend Masses, or all of the above! There are also other opportunities for liturgical music that spring up on occasion. If you want to play, we'll try to find you a spot where you can succeed. Rehearsals generally happen at Activity Periods in the two or three weeks leading up to the liturgies. SLUH Men for Life welcomes students to toward toward building and strengthening a Culture of Life in our school, in our community, and in our world. As Men for Others, we are committed to taking a stand for the dignity and the sanctity of all human life - born and unborn, strong and vulnerable - in a materialistic culture that too often encourages us to view each other as objects and commodities, useful for what we do and not for who we are as vibrant Children of God. Pastoral Teams are student clubs run out of Campus Ministry. Pastoral Teams are divided by grade level and meet once a week to build community, plan upcoming liturgies and outreach drives, learn about upcoming opportunities that relate to faith and justice, and engage in basic faith sharing. Each Pastoral Team is moderated by a Campus Minister, and they meet during lunch periods in the Campus Ministry office. Pax Christi works to promote the culture of peace and social justice throughout the SLUH community through prayer, reflection, and service. In listening to the call of Christ the peacemaker, Pax Christi forms a message of nonviolence and peace through reflections on events of the world, as well as events that affect our SLUH community. Pax Christi works through the power of prayer, self-reflection, and stimulating conversation to increase interest around social justice issues and inspire action to advocate for solutions to big problems of the world. Through learning experiences like the Arrupe Leaders Summit and the Ignatian Family Teach-In for Justice in Washington, D.C., Pax Christi fosters a culture of peace and justice. Meets: Tuesday, Activity Period in Campus Ministry Conference Room. Presidential Ambassadors serve SLUH in various capacities as representatives of the President and the school. Activities include hosting special events for the school, participating in tutoring and other service projects, speaking to alumni at reunions and speaking at large all-school masses. Further detailed information about President's Ambassadors may be obtained from Kim Walsh in the President's Office. Meets: in September and then at various times throughout the year. SLUH Students for Gender Equality (SLUH4GE; pronounced “SLUH Forge”), is a club formed by SLUH students seeking to address sexism and gender inequality both at our school and in our culture in general. Together we will talk through the injustices we see caused by sexism. Incorporating the experiences of our female faculty has been a huge part of the work we have done thus far. We believe that raising awareness and educating is the first step for making change. Students help to recognize how SLUH is sustainable and seek to further these efforts by working on a variety of projects such as the MO Supermileage Challenge, Project Going Green, the Ignatian Carbon Challenge, the USGBC Green School's Quest, and a Marketing initiative. All students who participate in any theatre production are considered Dauphin Players. Never to fear--Gadfly the magazine remains the bedfrock of the Gadfly Collective. We aim for a monthly production, but three times a semester ain't so bad now is it? Gadfly TV, sparked by its beloved founder, Mr. Michael Koenigs, ASC, has brought the Gadutopian vision to the masses. The Hack Club is an organization that is affiliated with the international Hack Club organization. The goal of the club is to help students learn computer programming, problem-solving, interpersonal skills, and collaborative teamwork through projects, tinkering, and participation in community hackathons where they apply their knowledge and skills to do good for the community. The club meets every two weeks and participates in hackathons. The Model U.N. program sponsored locally by Civitas is dedicated to experiential education through debate, diplomacy, and compromise. Through preparation for and participation simulations, students develop expertise in research, writing, public speaking, and the art of negotiation as they fight for the interests of countries they represent on their international interests on every conceivable topic relevant in today’s global community. The Prep News is the weekly student-run newspaper of St. Louis University High School. Our motto is "If nothing else, value the truth." Every Friday, we print eight pages (or more) of news, sports, features, and opinion about the SLUH community. The Prep News also strives to serve as a public forum for discussion of any topic relating to St. Louis U. High. The Prep News is a dedicated staff of writers, editors, and designers (who started out as underclassman seeking an article on a Friday afternoon) organize the paper's content and stay up late on Thursday nights to put the paper together. SLUH Crew works on the technical aspects of the productions here, as well as helps to further develop technical theater skills. The SLUH Sports Network provides the live streaming of SLUH sports games. Follow the link below to see games in the digital library. SLUHTube is a video production club that looks to highlight all things SLUH in short videos. The Mission of The Young Conservatives is to teach and promote constitutional conservative values at SLUH, which include: free market capitalism, small government, individual liberty, freedom, Judo-Christian values, personal responsibility, and a strict interpretation of the Constitution. Meetings every Wednesday during Activity Period in room J128. Carter Fortman (pictured right) was interning for the Republican Party for this election cycle and Ann Wagner (U.S. Representative, MO 2nd District) thanked SLUH's Young Conservatives for their hard work. Youth in Government is a student-driven simulation of state government which involves 1000 Missouri students. Every fall, SLUH students gather to prepare for their roles in the legislative, executive, or judicial branches or the print or video media. Each November, YIG students spend 3 days in Jefferson City carrying out the functions and responsibilities of our state government. They present and debate bills, try civil cases as attorneys, and run for elected office. The entire process is documented through a student press. YIG focuses on leadership skills and works to ensure that democracy is learned by each generation. Founded in 1989, Youth Leadership St. Louis (YLSL) is an internationally recognized program that informs, connects, prepares and empowers St. Louis area youth to become civic and community leaders. Each year, YLSL brings together high school juniors from approximately 30 public, private and parochial schools from across the region, as well as Girl Scouts of Eastern Missouri. No other program in St. Louis draws such a large and diverse group of students – 150 students representing 55 ZIP codes. Each program day immerses the students into a different issue in the region, giving them the opportunity to connect and learn from community leaders, collaborate with their peers and put their leadership skills into action. Student leaders (all from the class of 2020): Fitz Cain, Peter Curdt, Kaleb Ephrem, Matt Friedichs, Noah Hayes, Peter Michalski, Kameron Moses, and Victor Stefanescu. "St. Louis U High is unique in that it offers each student an opportunity to grow in leadership and community through its many clubs, whether it be an interest in theater, robotics, literature, social justice, politics, or any other interest, SLUH offers a place for that student."